Exceptional Aging: Inspiring or Oppressive? “Exceptional Aging”: Inspiring or Oppressive? Healthy aging is a growing topic in magazines, social media, television and other sources. Those currently aged 65 and older are extremely interested in staying healthy and active, while trying simultaneously trying to avoid disability and illness. Increasingly, news stories feature older people who are aging in exceptional ways, in response to a growing interest in the subject. Some stories feature Masters Athletes, highlighting the achievements of those dedicated to improving their physical performance as they age. However, a new trend emerging is the promotion of images and stories of older people exercising for mainly aesthetic reasons. These stories feature older adults wearing very little clothing, highlighting their lean and muscular physiques. One may argue that both types of stories (athletic and aesthetic) feature exceptional older adults who are inspirational, and are setting the bar higher for what we can expect as we get older. 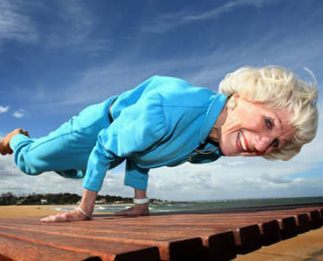 To some extent, it is very helpful to know that the body is capable of amazing things as we get older. It’s helpful to know what the human body might achieve given the right or perfect conditions, at advanced ages. For instance, yoga teacher Tao Porchon-Lynch is still running a thriving yoga teaching business at age 97, and marathoners Ed Whitlock and Olga Kotelko are showing us what is possible at age 85. Yul Kwon, aged 80, recently won first place at the Boston Marathon in his age category. Sedentary through much of his middle years, Kwon began training for half marathons at 60 and moved on to full marathons at age 68. His time for the Boston Marathon in April 2016 was 4 hours and 31 minutes, which is an outstanding accomplishment at age 80. However, a combination of drive and genetics most likely plays the largest part in the success stories of many older athletes and this does not mean that everyone can or should want to push themselves to such achievements. While these older athletes demonstrate what can be done at older ages, not everyone has the ability, drive, genetics, or desire to push themselves as they get older. In many cases, pushing the body to extremes as we get older can be outright dangerous and detrimental for the average person. Once particularly worrisome example of so called “successful aging” or exceptional aging is the spread of images featuring older adults with exceptionally lean and muscular physiques. While there is absolutely no criticism intended to those who find fulfillment and enjoyment in pursuing aesthetic goals as we get older, it is particularly scary if these images set a standard or aesthetic ideal for others to attain. It may be argued that one of the benefits of getting older is self-confidence – caring less about what others think of us and being comfortable in our own skin. Thus, images of older body builders such as 61 year old Wendy Ida or 75 year old Ernestine Shepherd may create pressures to conform to new aesthetic ideals as we age. If this image of lean and muscular perfection becomes the new ideal, then failure to achieve this standard brings with it the sense that we have not succeeded at aging well. While both body builders are doing what they enjoy and are great examples of finding their own passion, their images should not form a basis for the aesthetic ideal of average older people. As we get older, keeping our bodies functioning well and healthy is a great goal, but the drive for perfection is not a great goal. Pushing ourselves to achieve new body image ideals can harm body-image perceptions and decrease mental health in older adults, at a time when we are working hard already to stay healthy and reduce our stress levels. That said, there is much to be gained in following new trends, stories, and scientific information about the benefits of exercising for healthy aging. In fact, some of the most exciting research shows that as we age, our brains can benefit from exercise just as much as our bodies. A recent article in the Journal of Applied Physiology studied Masters Athletes with an average age of 80, and found that they had 40% more motor neurons than other healthy octogenarians. While we typically lose motor neurons with age, Master athletes not only kept more, but also had better communication, or signalling, between their brains and their muscles. Another study, this time by the University of Pittsburgh, found that Masters Athletes aged 40 to 80 scored better on tests of verbal memory, reaction time, visual memory, and visual motor speed. Both cognition and neurological improvements may be some of the key benefits to exercising at older ages, especially at higher levels. Therefore, as we encounter information through traditional media and social media about how to age healthfully and optimally, baby boomers and older adults would do well to view these stories with a critical eye. As we get older we (hopefully) know ourselves and our bodies better. We know what works for us, what feels good and what does not. We do not need to subscribe to any ideal that is pushed by media. We can and should think about how this information, research and general discourse on healthy aging impact our minds, just as much as it might impact our bodies. We should feel free to reject information that creates pressure, oppression, or ideals. Getting older means we can listen to our own bodies, follow what feels right for us and continually learn and grow. Exercise has the potential to radically change how we age, and the quality of our lives as we get older. Let us choose how we filter new information and put into practice what we learn in this new age and new stage of life. Let us find freedom in this information and new exercise practices for healthy aging rather than oppression. Let us exercise to support our bodies, our brains, and most importantly, our mental health.